A sermon preached on Children’s Sabbath in October of 2008 at Lebanon United Methodist. 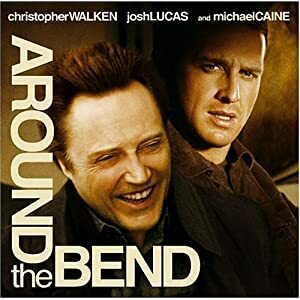 In the 2006 film Around the Bend, the death of the main character’s grandfather, brings him and his estranged father back together. The grandfather’s final wishes were for his son, grandson, and great-grandson to go on a journey together spreading his ashes at various locations as he had indicated on a map and series of sticky notes in KFC bags. As they continue on this journey, they begin to realize that the grandfather’s intention was more than just spreading ashes. His intention was to bring a family torn apart back together, and begin a journey of reconciliation. In her book, Thus Far on the Way, the Rev. Dr. Eileen Lindner recalls such billfold photos that many of us may carry of our children, grandchildren, nephews, nieces, or godchildren. We look at the photos and we see similarities between family members. He has his father’s nose. She has her mother’s chin. It is easy, gazing at the faces of those we love, to see them as made and beloved by God. But what, muses Lindner, must God’s billfold look like? As I pondered on this question this week, I wondered who among us has God’s nose or God’s chin or God’s hairline. Looking through old billfold photos is like looking through a persevered history of a family. I imagine that the children of this community are in God’s billfold. The children of Asia, Central America, India, and Africa without parents, living in orphanages .. The children who make up 4% of Hanover County’s population who are living in poverty and the children we have met through the Angel Tree program who are parent-less because their parents are incarnated. The children of Diques, Costa Rica living in poverty, poor in material things, but rich in faith. These are the images I imagine are in God’s billfold. Many of these children worry about where their next meal will come from. Many worry about where their water will come from. Many worry about having clothes to fit. Yet, despite these worries, as we saw in Costa Rica, these children and their families were able to put aside those worries and trust in God. For they understood that through it all, every worry, every doubt, every injustice, every thing that goes the wrong way, God will see them through. They’ve learned to trust and depend on God. The writer of Genesis clearly tells us that humanity was created in the image of God. This either says a lot about humanity or a lot about God. As it has been suggested, being created in the image of God does not mean a physical mirror image of God, but rather that the image of God within humanity is reflected by the words, actions, thoughts, and behaviors of humanity. An example of God’s image on earth can be found in the form of Jesus Christ. Jesus modeled a way to be God-like for the rest of humanity. Whether it was sitting down and eating lunch with the tax collector, sharing the Way with the Samaritan woman, or allowing the little children to come to Him. Jesus shows and tells us that in order to inherit the Kingdom of God, we must become like little children. We must trust and depend on God as a child trusts and depends on a parent. When asked what the greatest commandment was, Jesus answered two fold. Love God and love each other. If we are to truly love God and love each other, we are called to respond to the needs and injustices of all God’s children. As Martin Luther King, Jr. once said, “Life’s most persistent and urgent question is, what are you doing for others?” What are you doing to show your love for God and for each other? Jesus shows us, not just by his words, but by his actions, that being created in the image of God has a great deal of responsibility attached with it. As Peter Parker’s Uncle Ben tells him in the Spider Man movies, “With great power, comes great responsibility.” If we trust and depend on God than we have entered into a relationship with God. Through that relationship we have a responsibility to do for God and others as James says we can be doers of the Word – we can be doers of justice – we can be the miracle. For though we may not have God’s nose or chin or hairline, we have God’s eyes and hands and feet. Imagine, for a moment, God’s billfold with the image of every single child in it – including yourself – including those who have wandered away from God for awhile, God still has their picture in his billfold, with their name on the back – the children of Hanover, the children of Africa, the children of Costa Rica, the children of Iraq. Imagine this billfold unfolded until it circles the world. Each one of those faces, every child, held in God’s hands is beloved by God. We who love God are meant to love not just our own children, but all of God’s children. Jason: A friend sent me a link to this blog entry. I wrote and directed AROUND THE BEND, and was very moved by your sermon’s extrapolation of the bill fold scene in my film — my favorite scene in the movie, as a matter fact. Not that it’s the best; it just means a lot to me, since it was based on a true experience. But, more importantly, as you said… The scene speaks to a greater truth: The enormous wealth and bounty that comes from the ‘awareness’ that we are LOVED/KNOWN by our creator. How different our lives would be if we didn’t forget this so regularly. Wow. I’m humbled by your response. Thank you so much. There are so many “take aways” from your film, yet this one scene stood out to me the most. I think at different times in our lives we all can relate to Josh Lucas’ character. On a completely separate note, I loved Michael Caine in this film!